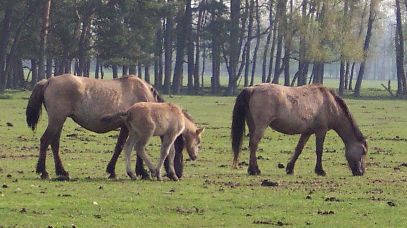 Dülmen Ponies are the only remaining pony of German origin that has always lived in completely natural conditions. Their bloodlines date back more than 600 years in Westphalia, Germany where there have always been pockets of land for them to roam. Over time their territories were shaped by the urban growth, until the mid 19th century when the Duke of Croy had them rounded up and taken to a refuge. Dülmen Ponies are hardy and robust. They are generally 12 to 13 hands high. They have a short stout neck with a compact body.Their legs are short and and their hindquarters are steeply sloped. They are found in chestnut, black, bay, and dun. They are good natured, intelligent, and easily trainable and tame. On the last Saturday in May the herd is rounded up every year and male yearlings are captured and auctioned. Mares are not sold; they are born and laid to rest on the wildbahn. They are used as work horses, farm animal, pleasure mounts, vaulting mounts, and cart horses.